A senior US official on Tuesday announced that the Obama Administration was ending its pressure on Israel to impose another Jewish building freeze and would be returning to the drawing board to try and figure out a new approach to brokering peace in the Middle East. Speaking to reporters via telephone, the official did not openly blame either side for the breakdown, but did hint that Washington had become aware that even if Israel imposed another building freeze, it still wouldn’t result in meaningful negotiations or progress with the Palestinians. Last month, Israeli Prime Minister Benjamin Netanyahu said that he had agreed in principle with US Secretary of State Hillary Clinton to impose another freeze for 90 days in order to facilitate renewed peace talks. 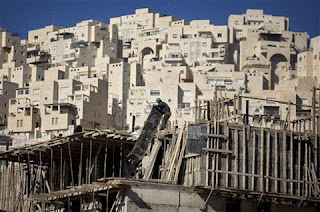 But the Palestinians immediately said the US-Israeli proposal did not go nearly far enough, as it did not prohibit Jewish construction in Jerusalem and had a very short timetable. Israel had already implemented a self-imposed 10-month Jewish building freeze from November 2009-September 2010 in order to entice the Palestinians back to the negotiating table. But the Palestinian leadership all but ignored the gesture up until the very last minute, when they joined talks, but threatened to leave if the freeze was not extended indefinitely. The US now intends to start a new round of consultation with Middle East leaders, and hopes to invite Israeli and Palestinian leaders to Washington this month for separate talks. But the Palestinians have other plans. Speaking in Greece on Wednesday, senior Palestinian Authority advisor Yasser Abed Rabbo declared that US efforts to bring peace based on bilateral negotiations have failed and that the Palestinians must now “turn to the broader framework of the international community” to impose a settlement to the conflict. Rabbo, who was traveling with Palestinian leader Mahmoud Abbas, suggested that the PA would now turn to the United Nations to recognize an independent Palestinian state, something the US has threatened to veto in the absence of a bilateral agreement with Israel.